Activision Publishing, Inc., a wholly owned subsidiary of Activision Blizzard, Inc. (NASDAQ: ATVI), announced today that it will bring the complete Skylanders Trap Team videogame to tabletsi at launch, marking the first time a full Skylanders® game will be available on iPad®, Kindle Fire and Android tablets day-and-date with the console version. 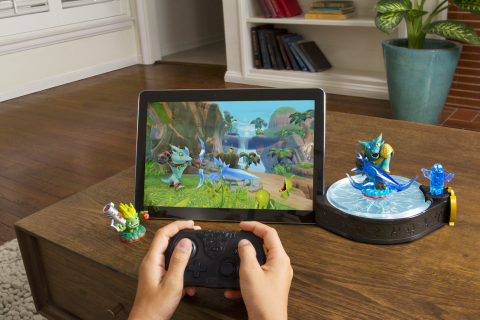 The tablet version of the game delivers the same experience with console-quality graphicsii and comes with its own high performance controller, delivering yet another significant technological leap to the Skylanders franchise. The Skylanders Trap Team Tablet Starter Pack will include a Bluetooth® Traptanium Portal™; an embedded Bluetooth® controller to provide the best gameplay experience possible; a built-in tablet stand; two Skylanders characters; two Traps and a display tray that lets Portal Masters keep track of the Traps they’ve collected and which villains they have trapped. Skylanders Trap Team brings a ground-breaking innovation to the Skylanders franchise by reversing the magic of its signature Toys-To-Life™ play pattern to let kids bring life to toys. Skylanders Trap Team allows Portal Masters to seek out the most wanted villains in all of Skylands, defeat them and pull them out of the game into their living rooms by capturing them in magical Traps. Fans can then play as both heroes and villains who join the forces of good in an all-new adventure. Now, for the first time in franchise history, fans can experience a full Skylanders game on the go, wherever and whenever they want. The tablet version of Skylanders Trap Team upholds the same gameplay-driven adventure as the console version with console-quality graphics,ii complete with lush, expansive environments that push the technological boundaries of select tablet devices. Like the console version of the game, all toys will be cross-platform compatible, with all skills and upgrades intact. “Controller” – Fans can play the game just like the console version using the Bluetooth Traptanium Portal and toys with the custom Bluetooth Skylanders game controller included in the Tablet Starter Pack. The Skylanders Trap Team Starter Pack will be available on October 5th in North America, October 10th in Europe and October 2nd in Australia on the following platforms: a variety of iPad®, Kindle Fire and Android tablets; Xbox One and Xbox 360 games and entertainment systems from Microsoft; PlayStation®4 system; PlayStation®3 system; Nintendo's Wii™ system and Nintendo's Wii U™ system. A different, unique adventure also will be available on the Nintendo 3DS™ hand-held system. The award-winning, $2 billion Skylanders franchise pioneered the Toys-to-Life category in 2011 with the debut of Skylanders Spyro's Adventure®. The game originated a new play pattern that seamlessly bridged physical and virtual worlds across multiple platforms. In October 2012, Skylanders Giants™ further evolved the genre and added the mega-sized Giant Skylanders and LightCore® characters to the collection of interaction figures. Skylanders SWAP Force launched in October 2013 and introduced an all-new play pattern - swapability. The Skylanders franchise was the top selling kids' videogame of 20131, and is now one of the top 20 videogame franchises of all time2. Skylanders Trap Team, the newest installment due out in North America on October 5, 2014, reverses the magic of bringing toys to life - incredibly letting kids pull characters out of the digital world into the physical world. For more information, please visit: www.skylanders.com and Activision.com/presscenter. Cautionary Note Regarding Forward-looking Statements: Information in this press release that involves Activision Publishing’s expectations, plans, intentions or strategies regarding the future, including statements about the expected release date of Skylanders Trap Team™, are forward-looking statements that are not facts and involve a number of risks and uncertainties. Factors that could cause Activision Publishing’s actual future results to differ materially from those expressed in the forward-looking statements set forth in this release include unanticipated product delays and other factors identified in the risk factors sections of Activision Blizzard’s most recent annual report on Form 10-K and any subsequent quarterly reports on Form 10-Q. The forward-looking statements in this release are based upon information available to Activision Publishing and Activision Blizzard as of the date of this release, and neither Activision Publishing nor Activision Blizzard assumes any obligation to update any such forward-looking statements. Forward-looking statements believed to be true when made may ultimately prove to be incorrect. These statements are not guarantees of the future performance of Activision Publishing or Activision Blizzard and are subject to risks, uncertainties and other factors, some of which are beyond its control and may cause actual results to differ materially from current expectations. © 2014 Activision Publishing, Inc., SKYLANDERS, SKYLANDERS TRAP TEAM, SKYLANDERS SPYRO’S ADVENTURE, SKYLANDERS GIANTS, SKYLANDERS SWAP FORCE, TRAPTANIUM PORTAL, LIGHTCORE, TOYS TO LIFE, and ACTIVISION are trademarks of Activision Publishing, Inc.
Apple, the Apple logo, and iPad, trademarks of Apple Inc., registered in the U.S. and other countries. App Store is a service mark of Apple Inc.